Marie-Francoise 9; 22 cattle, 8 sheep, 7 hogs. Emamuel LEBORGNE 22; Cecile TIBAUDEAU his wife 18; 26 cattle, 10 sheep, 8 hogs, 30 arpents, 6 guns. Alexandre GIROUARD 27; Marie LEBORGNE (wife) 22; Marie 3; Bernard 1; 5 cattle 6 sheep, 5 hogs. Bernard DAMOURS 28; Jeanne LEBORGNE his wife 18; 12 cattle, 11 sheep, 6 hogs. twins, 13; Claude 11; Jean 8; Marguerite 5; 15 cattle, 9 sheep 9 hogs, 35 arpents, 76 fruit trees, 2 guns. Abraham BOUDROT 41; Cecile MELLANSON (wife) 28; Charles 12; Michel; 9; Francois 6; Marie 4; Cecile 1/2; 10 cattle, 9 sheep, 6 hogs, 3 arpents, 8 fruit trees, 1 gun. Anne MELLANSON widow (of Jacques de LATOUR); Jeanne 10, Marie 8; Jean 5; Francois 3, Phillipes 2; 13 cattle, 4 sheep 2 hogs. Jeanne 11; Louise 8; 1 cow, 6 sheep, 16 hogs, 16 arpents, 80 fruit trees. Marie BOURG widow 25; 4 cattle, 6 sheep. sheep, 10 hogs, 26 arpents, 150 fruit trees, 1 gun. 5 hogs, 16 arpents, 40 fruit trees, 1 gun. Marie LANDRY (widow of Laurens GRANGER) 42, Claude Granger 20; Marie 17; Anne 13; Laurens 10; 8 cattle, 15 sheep, 6 hogs, 20 arpents, 50 fruit trees, 1 gun. Julien LORD 46; Charlotte GIROUARD (wife) 38, Jacques 20; Marie 18; Pierre 16; Anne 11; Jean-Baptiste 3; 20 cattle, 20 sheep, 12 hogs, 21 arpents, 6 fruit trees, 1 gun. Pierre CHESNET (Dubreuil) 52; Jeanne DOUCET (wife) 23; Pierre 7; Francois 5; 9 cattle, 10 sheep, 4 hogs, 15 fruit trees. Marie BOURG widow (of Vincent BRUN) 53, Margueritte 28; Francois 24; Jean 22; Anne 20; Marie 18 Jeanne 17, Rene 15; Elisabeth 13; 12 cattle, 15 sheep, 12 hogs, 8 arpents, 30 fruit trees. Sebastien BRUN widower 45; Jeanne 22; Claude 20; Abraham 18, Vincent 16, Jean 14; Antoine 13; Marie 20; 10 cattle, 15 sheep, 7 hogs, 21 arpents, 60 fruit trees, 1 gun. Rene MARTIN 27; Marie MINIERS (wife) 27; Joseph 6; Pierre 4; Charles 2; Rene 1/2; 18 cattle, 4 sheep, 8 hogs, 13 arpents, 50 fruit trees, 2 guns. Charles CALVE 29; Marguerite PELERIN 22 (wife); 10 cattle, 12 sheep; 5 hogs; 16 arpents; 20 fruit trees, 1 gun. Magdeleine 4; paul 2; 12 cattle, 14 sheep, 13 hogs, 16 arpents, 12 fruit trees, 1 gun. Claude TERRIOT 60; Marie GOTROT 53 (wife) 53; Marie 18; Claude 17; Magdelaine 15; Pierre 13; Joseph 10; Margueritte 8; 12 cattle, 20 sheep, 12 hogs, 18 arpents, 50 fruit trees, 1 gun. 40 fruit trees, 2 guns. Guillaume BLANCHARD 48; Huguette GOUJON (wife) 47; Rene 22; Antoine 19, Jeanne 17; Anne 15; Jean 13; Elisabeth 11; Guillaume 9; Madeleine 6; Pierre 3; Charles 1/2; 26 cattle, 24 sheep, 12 hogs, 34 arpents, 12 fruit trees, 3 guns. Laurent DOUCET 29; Jeanne BABIN (wife) 30; Michel 14; Alexandre 13; Pierre 8; Jeanne 6; Marie 4; Laurent 2; 13 cattle, 13 sheep, 6 hogs, 18 arpents, 7 fruit trees, 1 gun. 22 arpents, 10 fruit trees, 2 guns. Francois BROSSARD 45; Catherine RICHARD (wife) 35; Madeleine 18; Pierre 15; Marie 13; Catherine 7; Elisabeth 5; Francois 3; Claude 1/2; 15 cattle, 20 sheep, 14 hogs, 16 arpents, 2 fruit trees, 2 gun, 1 servant. Louis MAZEROLE 36; Genevieve FOREST (wife) 28; 1 cow, 6 hogs. Jean COMMEAU 43; Francoise HEBERT (wife) 37; Pierre and Estienne, twins, 18; Jean 15; Anne 14; Marguerite 13; Augustin 11; Marie 9; Francois 7; Claude 5; Francoise 4; Alexandre 3; Madeleine 1; 16 cattle, 35 sheep; 7 hogs, 39 arpents, 83 fruit trees, 1 gun. Martin BENOIT 57; Marie CHAUSSEGROS (wife) 43; Clement 21; Marie 19; Pierre 15; Claude 11; Catherine 8; Jeanne 6; Francoise 4; 2 cows, 8 sheep, 3 hogs, 40 arpents, 200 fruit trees. Bernard GODET 25; Jeanne TERRIOT (wife) 23; 12 cattle, 18 sheep, 8 hogs, 16 arpents, 50 fruit trees, 3 guns. Antoine HEBERT 27; Jeanne CORPORON (wife) 21; Antoine 6; Agnes 3; Marie 2; 6 cattle, 8 sheep, 2 hogs, 16 arpents, 21 fruit trees, 1 gun, 1 servant. Jean CORPORON 50; Francoise SAVOYE (wife) 46; Jean 21; Elisabeth 17, Cecile 15; Margueritte 13 Martin 11; Francois 9; Jean 7; Marie 4; Ambroise 2; 4 cows,; sheep, 1 servant. Pierre GODET, the younger, 46; Marie BLANCHARD (wife) 44; Pierre 22; Antoine 20; Germain 18; Guillaume 16; Denis 14; Marguerite 12; Jean 9; Bernard 7; Marie 4; 25 cattle, 35 sheep, 15 hogs, 26 arpents, 72 fruit trees, 2 guns. Jean PREJAN 47; Andree SAVOIE (wife) 31; Marie 14; Anne 11, Pierre 9; Jean 7; Francois 3; Madeleine 1; 17 cattle, 19 sheep, 5 hogs, 8 arpents, 60 fruit trees. Jean BASTARACHE 35; Huguette VINCENT (wife) 30; Marie 12; Francois 10; Anne 6; Jean 2; 12 cattle, 8 sheep, 9 hogs, 5 arpents, 1 gun. Alexandre RICHARD 30; Elisabeth PETITPAS (wife) 30; Marie 10; Marguerite 6; Jeanne 4; Pierre 2; 12 cattle, 20 sheep, 10 hogs, 16 arpents, 1 gun. Jean FARDEL 60; Marie GODET (wife) 50; Jean 22; 12 cattle, 15 sheep, 10 hogs, 6 arpents, 15 fruit trees, 1 gun 1 servant. Pierre TIBILAU 23; Marie DAIGRE (wife) 21; 7 cattle, 8 sheep, 4 hogs, 6 fruit trees. 7 fruit trees, 1 gun. Rene FOREST 28; Francoise DUGAS (wife) 20; Marie 2; Marguerite 1; 18 cattle, 22 sheep, 2 hogs, 16 arpents, 40 fruit trees, 2 guns. Francois LEVERON 50; Catherine SAVOIE (wife) 38; Jacques 23; Anne 14; Marie 12; Elisabeth 10; Jeanne 4; Jean-Baptiste 7; Pierre 2; 10 cattle, 13 sheep, 2 hogs, 15 arpents, 20 fruit trees. Clement VINCENT 22; Magdeleine LEVERON (wife) 16; 5 cattle, 8 sheep. Emanuel HEBERT 44; Andree BRUN (wife) 52; Catherine 25; Guillaume 18; Marguerite 16; Jean 15; Jacques 14; Alexandre 12; 25 cattle, 25 sheep, 6 hogs, 16 arpents, 2 fruit trees, 1 gun, 1 servant. Pierre DALESIE (deBezier) 60; Magdne. BRUN (wife) 56; Susanne 12. Pierre DUPUIS 28; Madeleine LANDRY (wife, widow of Rene RICHARD) 43; Michel (RICHARD) 17; Anne (RICHARD) 16 ; Antoine (RICHARD) 15; Pierre (RICHARD) 13; Rene 12; Jeanne 3; Marie 5; 34 cattle 25 sheep, 16 hogs, 40 arpents, 30 fruit trees, 3 guns, 1 servant. Marguerite 16; Claude 14; Guillaume 12; Denis 10; Charles 8; Germain 6; Madeleine 3; Anne-Marie 1/2; 20 cattle, 30 sheep, 12 hogs, 48 arpents, 18 fruit trees, 1 gun. Claude BERTRAN 45; Catherine PITRE (wife) 30; Claude 12; Rene 10; Jean 6; Marie 4; Jean 2; Pierre 1/2. Jacques LEGER 30; Madeleine, TRAAN (wife) 21; Jacques 3; Anne 3; 9 cattle, 14 sheep, 6 hogs, 69 arpents, 20 fruit trees, 1 gun. Pierre COMMEAU 40; Jeanne BOURGEOIS (wife) 30; Marie 9; Francoise 5; Anne 2; 15 cattle, 26 sheep, 6 hogs, 16 arpents; 15 fruit trees, 1 gun. 14 cattle, 18 sheep, 10 hogs, 32 arpents. Pierre TIBAUDEAU 65; Jeanne TERRIOT (wife) 57; Jean 24; Antoine 22; Pierre 21; Michelle 19; Claude 13; Catherine 11; Charles 7; 20 cattle, 20 sheep, 8 hogs, 32 arpents, 20 fruit trees, 4 guns. Germain LANDRY 25; Marie MELLANSON 25 (wife) 25; Alexandre 2 1/2; Abraham 3; 6 cattle, 14 sheep, 1 gun. Pierre COMMEAU 47; Jeanne BOURG (wife) 37; Abraham 18; Margueritte 17; Anne 16; Jeanne 15; Joseph 14; Madeleine, 13; Pierre 12; Angelique 11; Elisabeth and Catherine, twins, 10; Francoise 9; Cecile 7; Jean 2; 11 cattle, 15 sheep, 8 hogs, 26 arpents, 30 fruit trees, 1 gun. Claude PITRE 25; Marie COMMEAU (wife) 20; Marie 1; 2 cows, 4 sheep. Pierre MARTIN 38; Anne GODIN (wife) 29; Pierre 8, Francois 6; Marie 5; Claude Marie Martin, sister, 19; 12 cattle, 12 sheep, 10 hogs, 22 arpents, 70 fruit trees, 1 gun. 10 sheep, 6 hogs, 2 arpents, 3 fruit trees, 1 gun, 1 servant. Estienne COMMEAU 50; Marie LANDRY (wife) 52; Alexandre 24; Pierre 12; 15 cattle, 25 sheep; 10 hogs, 22 arpents; 40 fruit trees, 3 guns. Claude DOUCET 23; Marie COMMEAU 21 (wife); Charles 1; 7 cattle, 7 sheep, 4 hogs, 53 arpents. Louis ALLAIN 44; Marguerite BOURG (wife) 31; Pierre 7; Marie 5; 10 cattle, 12 sheep, 8 hogs, 5 1/2 arpents, 31 fruit trees, 4 guns 1 servant. Charles ROBICHO 30; Marie TIBAUDEAU (wife) 33; Angelique 10; Charles and Rene, twins, 8; Augustine 6; Jean 4; Alexandre 2; Joseph 1; 9 cattle, 9 sheep, 6 hogs, 10 arpents, 1 gun. Pierre LEJEUNE 48; Marie TIBAUDEAU (wife) 37; Marie 12; Pierre 9; Jeanne 8; Germain 5; Marguerite 3; Jean 1; 11 cattle, 14 sheep, 5 hogs, 10 1/2 arpents, 10 fruit trees, 1 gun. Estienne PELLERIN 50; Jeanne SAVOIE (wife) 33; Pierre 18 Jean 14; Anne 16; Jeanne 11; Bernard 8; Alexandre 5; Charles 5 cattle, 9 sheep, 5 hogs, 10 1/2 arpents, 7 fruit trees. Jacques DOUCET 25; Marie PELLERIN (wife) 20; Magdelaine 2; 5 cattle, 6 sheep, 2 hogs, 5 arpents, 1 gun. Jean GODET 42; Jeanne LEJEUNE (wife) 47; 3 cows, 4 sheep, 3 hogs, 1 1/2 arpents, 1 gun. Charles DOUCET 40; Huguette GUERIN (wife) 27; Claude 13; Charles 10; Jean 8; Francois 6; Madeleine 4; Germain 1/2; 6 cattle; 9 sheep, 6 hogs, 1 gun. Prudent ROBICHO 27; Henriette PETITPAS (wife) 25; Marie 6; Joseph 4; Prudent 3; Pierre 1 8 cattle, 8 sheep, 3 hogs, 5 1/2 arpents, 1 gun. Bernard DOUCET 30; Madeleine, CORPORON (wife) 25; Jean-Marie 7; Marie 4; 3 cattle, 4 sheep, 2 hogs, 2 arpents, 5 1/2 arpents. Claude LANDRY 35; Marguerite TERRIOT (wife) 30; Madeleine 14; Marie-Josephe 12; Claude 10; Marguerite 7; Jean 5; Anne 2; 10 cattle, 13 sheep, 8 hogs, 22 arpents, 3 fruit trees, 1 gun. Pierre LANDRY 40; Madeleine, ROBICHO (wife) 35; Pierre 16; Marguerite 11; Jean-Baptiste 8; René 5; Francois 2; 6 cattle, 9 sheep, 8 hogs, 22 arpents, 1 gun. Pierre MAISONNAT 45; Judith (wife) 35; 12 cattle 2 guns, 1 servant. Jean BABINEAU 47; Marguerite BOUDROT (wife) 50; Pierre 17; Anne 15; Marie 6; Marguerite 4; 12 cattle, 12 sheep, 6 hogs, 22 arpents, 1 fruit tree, 1 gun. Francoise BOUDROT (widow of Etienne ROBICHO) 55; Alexandre 23; Francois 20; 6 cattle, 7 sheep, 6 hogs. Denis PETITOT 35; Marie ROBICHO (wife) 25; Denis 10; Marie 5; Madeleine 4; Anne 2; 5 cattle, 8 sheep, 2 1/2 arpents, 1 gun. Jacques LEVANIER 33; Jeanne PELLETRET (wife, widow of Barnabe MARTIN) 49; (children of MARTIN) Estienne 19, Cecile 16, Elisabeth 10; 9 cattle, 12 sheep, 2 hogs, 133 arpents, 2 guns. Francois COSTE 27; Madeleine MARTIN (wife) 24; Marie 2; Madeleine 1/2, 3 cattle, 4 sheep, 1 gun. Jean BELLIVEAU 44; Jeanne BOURG (wife) 44; Charles 20; Antoine 18; 15 cattle, 15 sheep, 8 hogs, 19 arpents, 3 guns. Jean BELLIVEAU, the younger, 24; Madeleine MELLANSON (wife) 19; Charles 1; 6 cattle, 6 sheep, 5 hogs, 1 gun. Francois ROBIN 46; Marie PINCELET (wife) 55; Marie 25; Pierre 23; Francois 16; Jeanne 13; Marguerite 15; Jeanne 10; 2 cows, 2 hogs, 2 arpents, 4 fruit tree. Jean LABAT 60; Rene GOTROT (wife) 46; one servant 17; 10 cattle, 10 sheep, 19 hogs, 34 arpents 3 guns. Andre SIMON 33; Marie MARTIN (wife) 29; Pierre 9; Marie 7; Madeleine 5; Charles 2; 6 cattle, 2 sheep, 6 hogs, 15 arpents. Louis CHENAIS 21; Jeanne MARTIN (wife) 25; 1 cow. Claude GUAIDRY 50; Marguerite PETITPAS (wife) 40; Abraham 20; Claude 16; Jean-Baptiste 14; Charles 12, Alexis 10, Augustin 8, Marie-Josephe 6; Claude 4; Joseph 3; Pierre 1/2, 10 cattle, 2 Sheep, 8 hogs, 8 arpents, 1 gun. Bonaventure TERIOT 57; Jeanne BOUDROT (wife) 50; 6 cattle, 10 sheep, 5 hogs, 14 arpents, 20 fruit trees, 1 gun. Francois BOUDROT 32; Madeleine BELLIVAUX (wife) 22; Jean 5; Joseph 1/2; 10 cattle, 10 sheep, 3 hogs, 32 arpents, 20 fruit trees, 1 gun. 25 sheep, 6 hogs, 32 arpents, 20 fruit trees, 3 guns. Bernard BOURG 50; Francoise BRUN (wife) 46, Rene 21; Jeanne 19; Anne 17; Clair 15, Francoise 14; Abraham 12; Renee 9; Marie 7; Claire 4; 19 cattle, 40 sheep, 12 hogs, 35 arpents, 45 fruit trees, 2 guns. Martin BOURG 48; Marie POTET (wife) 42; Abraham 20; Pierre 18; Jeanne 15; Ambroise 12; Francois 10, Marie 10; Madeleine 4; Charles 1/2; 19 cattle, 27 sheep, 9 hogs, 35 arpents, 45 fruit trees, 2 guns. Abraham BOURG 38; Marie BRUN (wife) 40; Francois 20, Jean-Baptiste 15; Marguerite 13; Claude 11; Pierre 9; Marie 7; Michel 5; Charles 3; Joseph 1/2; 12 cattle, 20 sheep, 12 hogs, 16 arpents, 60 fruit trees, 2 guns. Rene GRANGER 23; Marguerite TERIOT (wife) 21; Marie 2, Madeleine 1/2; 6 cattle, 10 sheep, 10 1/2 arpents, 1 gun. Martin BLANCHARD 53; Marguerite GUILLEBAUD (second wife) 28; (son by first wife Francoise BOUDROT) Rene 20 (children by second wife: Marguerite 11; Pierre 8; Martin 5); 14 cattle, 9 sheep, 6 hogs, 10 1/2 arpents, 20 fruit trees, 2 guns. Alexandre LORD 24; Jacques MARTIN 20; Abraham BOURG 20; Martin AUCOIN 20; Michel AUTOIN 19; Olivier DAIGLE 23; Jean BOURG 16; all bachelor inhabitants. Jerome GUERIN 33; Elisabeth AUCOIN his wife 18. There are at Port Royal 575 persons, 982 cattle, 1136 sheep, 568 hogs, 1275 arpents of cultivated land, 1584 fruit trees, 82 guns and 8 servants. Sieur Jacques BOURGEOIS 82; Jeanne TRAHAN his wife 72; Germain BOURGEOIS 48; Madeleine DUGAS his wife 34; Guillaume 24; Agnes 12; 22 cattle, 15 hogs, 21 arpents, 3 guns, 1 servant. Pierre ARSENAU 48; Marie GUERIN (wife) 36; Abraham 20; Charles 9; Jacques 7; Francois 4; Anne 1; 12 cattle, 6 sheep, 5 hogs, 21 arpents, 2 guns. 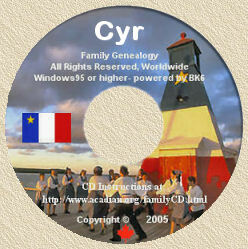 Marie BOURGEOIS widow (of Pierre SIRE and Germain GIROUARD) 47; Jean SIRE her son 26; Francoise MELLANSON his wife 14; children of widow BOURGEOIS; Pierre SIRE 22; Guillaume (SIRE) 19; Germain (GIROUARD) 15; Agnes (GIROUARD) 13; 9 cattle, 2 sheep, 6 hogs, 21 arpents, 3 guns 1 servant. Pierre 3; 4 cattle, 3 sheep, 1 hog, 21 arpents, 1 gun. Charles BOURGEOIS 25; Marie BLANCHARD (wife) 18; Jeanne 5; Charles 3; Marie 2; 20 cattle, 8 sheep, 14 hogs, 63 arpentsl 1 gun, 1 servant. Jean GUERCY 22; Anne BOURGEOIS (wife) 20; Marguerite 2; 8 cattle, 6 sheep, 12 hogs, 2 arpents, 1 gun. Roger GUERCY 50; Marie POIRIER (wife) 50; Pierre 21; Guillaume 18; Michel 13; Madeleine 10; Marie 1; 7 cattle, 20 sheep, 12 hogs, 4 arpents, 30 fruit trees, 2 guns. Michel DEVAUX 35; Mar. MARTIN (wife) 35; Angelique 14; Marie 7; Anne 6; Pierre 4; Magdeleine 4 months; 12 cattle, 6 sheep, 1 hog, 2 1/2 arpents, 1 gun. Jacques BLOU 58; Mar. GIROUARD (wife) 48; Marguerite 17; Cecile 15; Madeleine, 13; Marie-Josephe 11; Joseph 7; Anne 3; 20 cattle, 8 sheep, 2 hogs, 13 arpents, 1 gun. Sebastien CHIASSON 28; Marie BLOU his wife 28; Jacques 4; Marie 2; 24 cattle, 12 sheep, 10 hogs, 63 arpents, 2 guns. Manuel MIRANDE 50; Mte. BOURGEOIS (wife) 40; Joseph 18; Francois 16; Terese 15; Madeleine 13; Jean 10; Francoise 7; Louis-Joseph 6; Michel 3; Alexis 1 month; 18 cattle, 10 sheep, 5 hogs, 10 arpents, 1 gun. Pierre ARSENAULT 22; Anne BOUDROT his wife 21; 4 cattle, 8 sheep, 1 hog. Marie-Madeleine GIROUARD (widow of Thomas CORMIER?) 45; Germain 18; Pierre 16; Claire 14; Marie and Agnes, twins, 12; Jeanne 10; 12 cattle, 4 sheep, 8 hogs. Alexis CORMIER 22; Marie LEBLANC (wife) 19; 7 cattle, 4 sheep, 1 hog. Michel POIRIER 33; Marie CHAISSON (wife) 20; Michel 5; Marie 4; Cecile 2, 10 cattle, 4 sheep, 2 hogs, 2 arpents, 1 gun. Francois CORMIER 26; Marguerite LEBLANC (wife) 22; Marguerite 5; Marie 4; Pierre 3; Anne 5 months; 10 cattle, 2 sheep, 4 hogs, 7 1/2 arpents, 1 gun. Michel BOUDROT 38; Marie CORMIER (wife) 28; Madeleine 7; Michel 5; Isabelle 2; (infant) 8 days old; 12 cattle, 4 sheep, 5 hogs, 21 arpents, 1 gun 1 servant. Michel HACHE 36; Anne CORMIER (wife) 25; Michel 7; Joseph 5; Marie 4; Jean-Bap. 2; 12 cattle, 12 sheep, 5 hogs, 18 arpents, 1 gun. Michel POIRIER 48; Marie BOUDROT (wife) 48; Claude 23; Anne 20; Pierre 18; Jean 17; Louis 14; Charles 10; Francois 7; Jacques 5; Joseph 3; 25 cattle, 5 sheep, 2 hogs, 22 arpents, 2 fruit trees, 2 guns. Mel, POIRIER 25; Anne BOURGEOIS his wife 16; 4 cattle, 2 sheep, 1 hog, 4 arpents, 1 gun. Rene BERNARD 35; Madeleine DOUCET (wife) 28; Rene 8; Marie 5; Jean-Baptiste 2; 12 cattle, 10 sheep, 6 hogs, 13 arpents, 1 gun, 1 servant. 26 cattle, 5 sheep, 10 hogs, 13 arpents, 2 guns. 14 cattle, 4 sheep, 10 hogs, 16 arpents, 1 gun. 8 hogs, 16 arpents, 1 gun. Laurent CHASTILLON 42; Anne GUERIN (wife) 35; Marie 18; Guillaume 16; Charles 10; Marie-Josephe 8; Marie-Madeleine 4; Francois 1 1/2; 8 cattle, 7 sheep, 3 hogs, 6 arpents. Pierre GODIN 21; Catherine PELLERIN his wife 23; 3 cattle, 3 sheep, 2 hogs, 6 arpents, 1 gun. Pierre GODET 46; Anne BLANCHARD (wife) 53; Pierre 23; Claude 21; Abraham 19; Mie, and Madeleine, twins, 16; Jeanne 14; Augustin 12; 10 cattle, 4 hogs, 10 arpents. Pierre MERCIER 51; Andree MARTIN (wife) 45; Jeanne (PELLERIN) 22; Pierre (PELLERIN) 20; Joseph 18; Madeleine 14; Alexandre 12; Guillaume 9; Agnes 7; 7 cattle, 17 sheep, 5 hogs, 10 arpents, 1 gun. (Total) 178 persons, 352 cattle, 176 sheep, 160 hogs, 298 arpents of cultivated land, 32 guns. Louis D'AMOURS Seigneur de Temsec 36; Marguerite GUYON his wife 30; Marie-Josephe 4; Charlotte 2; Louis 1 month; 26 cattle, 25 hogs, 50 arpents, 5 guns, 3 servants. Charles D'AMOURS 34; Anne-Marie TIBAUDEAU (wife) 16; 4 arpents, 1 gun, 1 servant. Dlle, Louise GUYO, widow of D'AMOURS; Joseph 11; Louis 9; Francois-Mathieu 6; Nicolas 3; Jean 13; 5 cattle, 12 hogs, 40 arpents, 2 guns, 2 servants. Pierre GODIN 33; Jeanne COCHON (wife) 31; Louise 9; Angelique 6; 8 hogs, 5 arpents 2 guns. Charles CHAUVET 29; Emee Joseph his wife 24; Jeanne 9 months, 4 arpents, 1 gun. Antoine DU VIGNEAUX; 4 arpents, 1 gun. Jean MARTEL 48; Marie PROMMILLE 14; 4 hogs, 4 arpents, 3 guns, 3 servants. Rene DAMOURS 37; Charlotte LEGARDEUR (wife) 24; Rene 7; Joseph 5; Marie-Judith 2; Marie-Angelique 1; 9 cattle, 15 hogs, 15 arpents, 2 guns, 1 servant. Gabriel GODIN 37; Angelique Jeanne (wife) 24; Louise 7; Louis 5; Joseph 3; Jacques-Philippes 7 months; 5 cattle, 4 hogs, 14 arpents, 2 guns. Francois MOYSE 35; Magdelaine VINCENT (wife) 30; Madeleine 12; Francois 9, Francoise 8; Louis 4; 3 hogs, 40 arpents, 1 gun.